Annapurna Semi Circuit Trekking, a wonderful and scenic journey around worlds famous and prime trekking destination where walk leads you towards northern side of Annapurna massive peaks, within fascinating places includes interesting farm villages of Buddhist culture and traditional life as it was since past hundred of centuries. On marvelous Annapurna Semi Circuit Trek leads you into deep green forested areas with daily scenic views of Annapurna and Manaslu range of mountains and then slowly our journey enters into high arid and barren country at Manang valley enclosed within giant peaks of Annapurna northern peaks with range of Chulu and Pisang peaks. After an enjoyable time around villages of Manang within Pisang-Braga and main Manang with time to explore its interesting culture and monasteries of immense interest with eye catching scenery of glaciers and high peaks of Gangapurna-Tilicho including range of Annapurna . 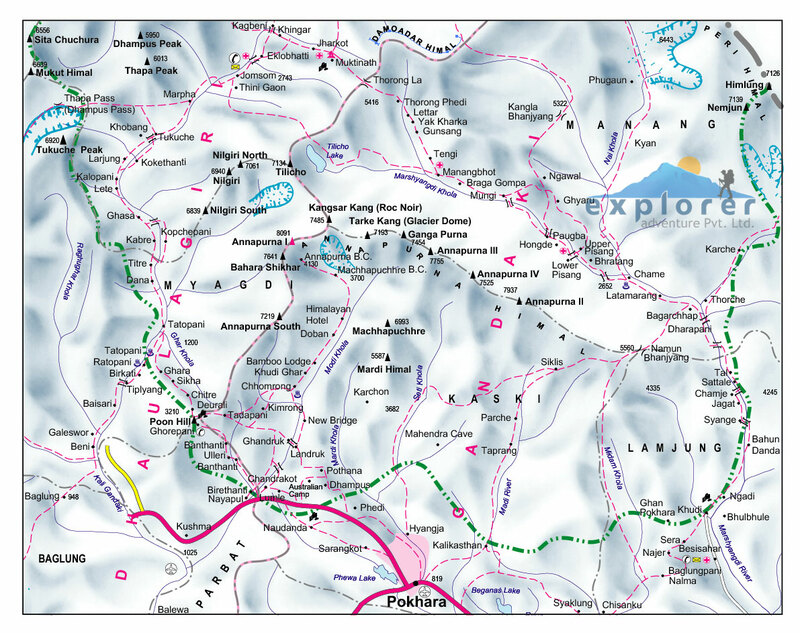 With time at Manang with rest day for acclimatization and local hike then crossing over high Thorang-la Pass to reach at Lower Mustang at holy Muktinath and Jomsom town for scenic short flight to scenic Pokhara city. 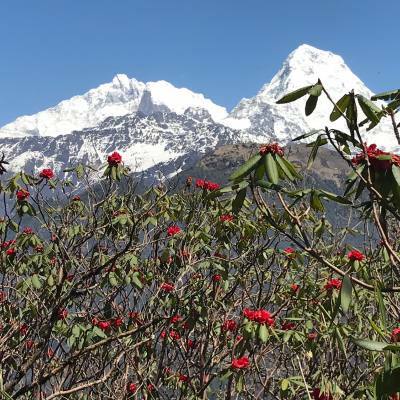 Annapurna Semi Circuit Trek, starting with interesting drive from Kathmandu towards Nepal Mid West around low and warmer areas of Lamjung district at Besisar the headquarter town of the area, then towards our starting point of the trek at Syange village. From Syange climb into cooler region within deep woodland and charming villages with Buddhist monuments of Mani or prayer wall, then entering into scenic Manang valley and its interesting villages Pisang-Braga and Manang itself on Annapurna circuit route. After an enjoyable and marvelous time walk at Manang main village where our route to cross highest pass of the adventure over Thorang-la above 5,416 m facing spectacular views of mountains and then ending our walk at holy Muktinath within Mustang area. Completing our fabulous journey at nice Jomsom town famous for apples and its products located on ancient Trade Route of Nepal and Tibet, from Jomsom taking a short scenic flight to land beautiful Pokhara a leading touristic city where our marvelous and overwhelming adventure on Annapurna Semi Circuit completes. 1 Day 1: Arrival in Kathmandu and transfer to hotels.On reaching Kathmandu Tribhuwan International Airport where you will be warmly received by our guide and staff and then transfer you to your respective hotels in the hub of Kathmandu city. First check into your hotel rooms on getting refreshed from the flight and with Jet-Lag, then join with other members of Annapurna Semi Circuit trekking for group briefing, where our expert guides will inform regarding your stay in Nepal, hotels, trekking, local lodge and overland drives with do’s and don’ts information, evening welcome group dinner in authentic Nepalese restaurants with Folk cultural programs to entertain you during your meals. 2 Day 2: In Kathmandu with sightseeing tour around world heritage sites.Morning after breakfast leave the hotel for exciting guided sightseeing around Kathmandu where our city guide will lead you to places of interest, Kathmandu a metropolitan city still retains its ancient heritage and varied ancient culture where you will visit world heritage sites around Kathmandu for half day or full day. After an interesting and wonderful tour of ancient historical and religious sites around Kathmandu, with afternoon free preparation for next day journey to Nepal Mid West for Annapurna Semi Circuit Trekking. 9 Day 9: Trek to Yak Kharka 4,210m - 04 hrs.After a good rest and overnight at Manang villager walk further North-West towards Ghunsang village with short uphill to reach at Yak Kharka, an interesting walk with views of snowcapped mountains, on crossing a small stream reaching Yak Kharka for overnight stop, a small settlement with views of Gangapurna, Annapurna III and Chulu Peaks. 12 Day 12: Drive to Jomsom 2,715 m - 02 hrs afternoon free at leisure to explore the town.From this peaceful religious and holy site of Muktinath with views of Dhaulagiri range, at Muktinath our trekking completes taking a ride to reach lower areas of Mustang, since the motor-able came walking is disturbed by movement of vehicles, so taking a drive instead of walking. Drive leads towards wide Kaligandaki River within its windswept landscapes to reach at Jomsom the headquarter town of Mustang area, an interesting town inhabited by Thakali people of Buddhism religion, as these tribe on long history of trade with Tibet as this town situated on main old Trans Himalayan salt and caravan trade of Nepal and Tibet. With time here to enjoy walks around and observe the local people fascinating culture and traditions. 15 Day 15: Depart for international flight home ward bound or to respective countries.Your last memorable day in Nepal after a wonderful adventure and experience on Annapurna Semi Circuit trekking with great service of Explorer Adventure, and as per your international flight then transfer to Kathmandu international airport for homeward bound or to your respective destinations.